Across the country solar power and other renewable sources of energy are driving job growth and economic development particularly in rural areas. Whether you are a business interested in solar to power your buildings, or a landowner looking to lease land for a large solar project, there are many ways to go solar. A home, business, or organization can install solar on their roof or on their land that directly powers their home or building. Extra energy produced by their solar array is credited to them through net-metering. This is called a “behind the meter” solar installation. Trajectory Energy Partners can work with you to determine if a behind the meter system will work for your facility and in your area. A utility scale solar project is a large solar system connected directly to the electric grid and powering hundreds or thousands of homes. These projects can range from 50 acres to thousands of acres. Trajectory Energy Partners works with landowners, electricity users, and communities to evaluate options for the development of utility scale projects. A community solar system is a smaller utility scale solar project that opens up access to homeowners, businesses, and organizations that can’t install solar on their roof or property. They can participate in a community solar project and be credited for the energy produced by their share of the solar installation. 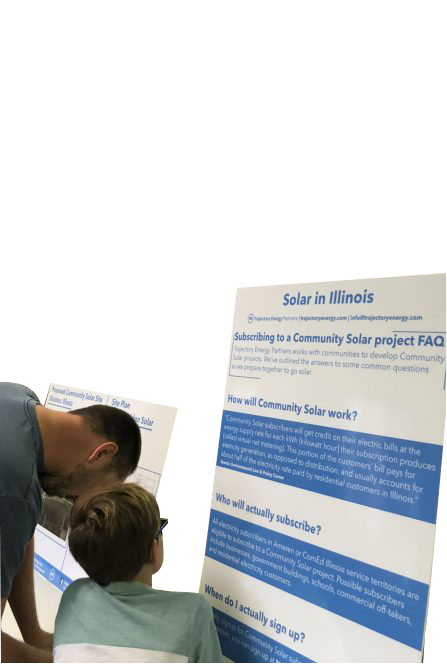 Community solar projects are usually in the 15 to 30-acre size range and Trajectory Energy Partners works with landowners to integrate these projects into the local landscape.